More than a thousand protesters were detained across the country. 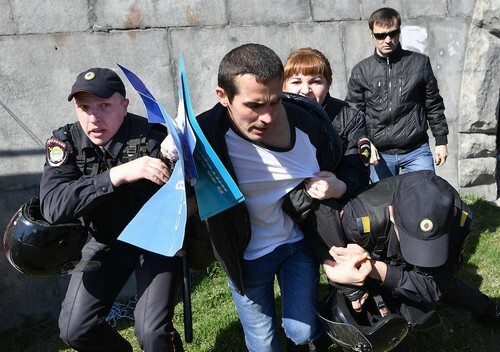 Police officers detain a protester at an anti-Putin rally in the Urals city of Yekaterinburg. Two days before President Vladimir Putin is due to be inaugurated for a fourth time, more than one thousand people were detained across Russia at protests against his extended rule. It was the first major protest against Putin since January. Then, opposition politician Alexei Navalny had called for a boycott of the March elections after he was barred from standing due to a fraud conviction that his supporters say is politically motivated. The mostly peaceful protests drew thousands onto the streets. They did not, however, stop Putin from winning 77 percent of the vote. The president was re-elected with a record number of ballots, making him the longest-serving leader since Josef Stalin. Unlike January’s demonstration, the protests on Saturday turned violent. While thousands across the country — from Vladivostok in the Far East to Kaliningrad on the Baltic Sea — marched in the protests which were called by Navalny last month, it was in the capital where the clashes were most severe. As the groups converged, a pro-Kremlin activist punched Alexei Berezhkin, a 27-year-old Navalny supporter. A policeman intervened, telling the aggressor to disperse. Then he spoke sternly to Berezhkin. “The policeman told me I was blocking the man’s way,” Berezhkin told The Moscow Times. Then came the arrests. Only fifteen minutes after Navalny’s supporters arrived en masse, riot police, known colloquially as “cosmonauts” for their bulbous helmets and armor, spilled into the square, snatching protesters one by one. Opposition politician Alexei Navalny speaks to the crowd on Moscow’s Pushkin Square, minutes before being detained. Ten minutes later, he, too, was detained. Some protesters lit smoke bombs and threw bricks at policemen. Others were beaten bloody with batons in scenes that were reminiscent of the massive clashes between law enforcement and protesters on the eve of Putin’s inauguration in 2012. That day six years ago marked the beginning of a clampdown on Russia’s emerging opposition movement. For some, Saturday was an opportunity to reaffirm that some semblance of the movement still exists in Russia. Many of those present were long-time Navalny supporters — mostly young people who had come to multiple protests. Others had come out for the first time. Svetlana, a 53-year-old electrician who declined to give her last name, was smiling as she listened to the protesters chant. “It’s so good to see that I’m not alone,” she said. Although she had harbored doubts about Putin for some time, what finally pushed her over the edge, she said, was the recent ban on the Telegram messaging service. “If we don’t stop them they’ll soon block us off from the entire world,” she said. “Then we’ll be living like in ‘1984,’” she added, referring to the dystopian novel by George Orwell. A week ago, more than 12,000 people gathered in central Moscow to protest the state media watchdog Roskomnadzor’s decision to block Telegram over its refusal to hand over encryption keys. “Whether Navalny can galvanize those people will be a big test of his political strength,” said Grigory Golosov, a St. Petersburg-based political analyst. Speaking to The Moscow Times on the eve of Saturday’s protest, though, analysts said that while Russians regularly take to the streets to demonstrate against specific issues, they are unlikely to protest the system as a whole. Others noted the fact that Navalny has increasingly pushed away moderate Russians by refusing to align himself with other opposition politicians and being seen as unrelenting in his approach. Moscow city authorities, for example, had proposed Prospekt Sakharova, a large avenue also in the city center but away from the main thoroughfare, as a location for the protest. 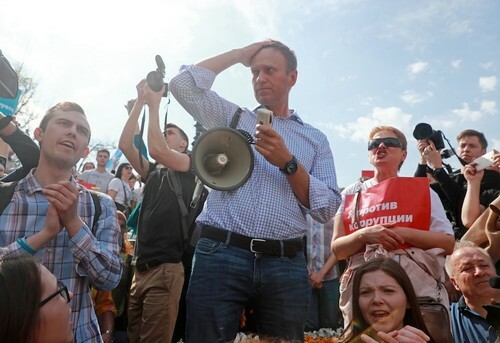 But Navalny refused the opportunity to hold a legal protest, opting to organize his closer to the Kremlin instead. 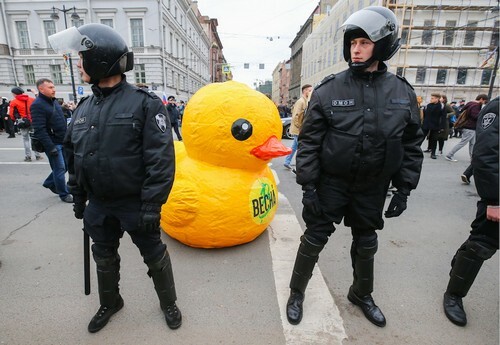 Many protesters brought with them images and of a yellow duck, which has become a symbol of Navalny’s anti-corruption movement. Some protesters, like 21-year-old university student and first-time protester Alexei, however, saw Navalny as their only hope of effecting change. “I couldn’t care less if Putin stayed in office forever,” Alexei said, declining to provide his last name. “But he should follow the constitution. Right now, he is violating our rights to free speech. If before they limited what voices or information were heard, now they are blocking it out entirely,” he said, referring to the Telegram ban. Most protesters who spoke to The Moscow Times, though, were not optimistic about change in the short term. Leo Amigud, a 42-year-old IT worker, said he joined the protest out of solidarity with Russia’s youth.